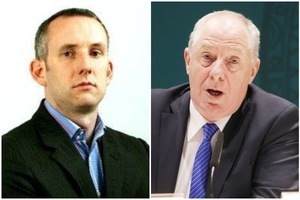 Ken Foxe, in both The Sunday Times and the Irish Mail on Sunday reported that the Minister for Rural and Community Development Michael Ring allocated almost €120,000 to a project – involving pedal-powered carriages on a disused railway line – in his constituency “despite warnings from civil servants it could set ‘problematic precedents'”. 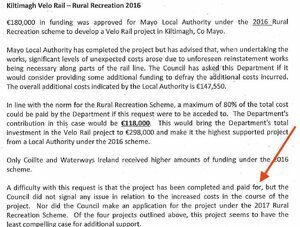 He also wrote the Kiltimagh Velo project received the single largest funding allocation of any local authority project last year. 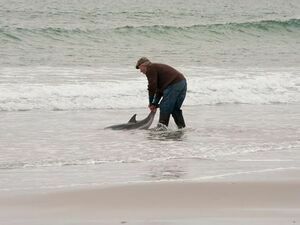 Mr Ring spoke to Midwest Radio about the project and said he wouldn’t be apologising to Mr Foxe, the Irish Daily Mail [sic] or The Sunday Times for any decision he makes regarding funding allocations. “First of all, I have to say, that I’m the minister of the department and I make the decisions, as minister. That was Ken Foxe and the Daily Mail and The Sunday Times. I didn’t see Ken Foxe reporting that I gave €2million to inner city Dublin before Christmas in relation to projects that need to be done there – particularly in disadvantaged areas. 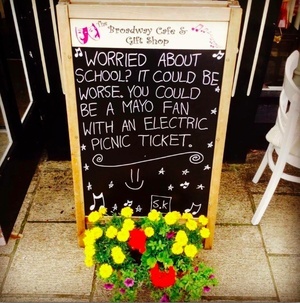 “But when a few euros come to Mayo, they seem to have a major problem with it. Ken Foxe and the Daily Mail and The Sunday Times seem to have a problem with any funding coming into Mayo, so, in future now, do I have to correspond with Ken Foxe and anybody else when I’m putting funding into Mayo. “…I make decisions on the basis of the decisions that come before me and I have no problem making big decisions, that’s my job, as minister. I make decisions every single day. Posted in Misc and tagged funding, Ken Foxe, Mayo, Michael Ring at 2:57 pm on March 7, 2018 by Bodger. +1. You’d have more respect for these jokers if they just admitted what they were doing instead of coming out with this kind of BS. why shouldn’t Kiltimagh get a Velorail and put it in the same league as Ogdenville and North Haverbrook? It certainly put them on the map. That is true! Lotto grants are dealt with by the Government. They dictate where Lottery funds go so it was no surprise that a lot of money went to Mayo for a few years. It would appear the man makes decisions. Like the ones in the Wild West where you push the lever to get away from the sheriff or the ones the loud brits use on stag weekends down O’Connell street? Says the baying mob, with pitchforks at the ready. I left a poverty stricken, unemployment black spot that was Mayo in late 80’s for London. I live in Kildare now. When I return to visit today, I’m still astounded at the lack of investment compared to other parts of the country. I’ve never voted Fine Gael in my life, but there are other places outside of Mayo I’d be quicker to begrudge money going to. The condescending country bumpkin tone isn’t a good look either. Sophisticated city slickers, yeah right. The issue isn’t investment it’s skulduggery. By the way, the entire Country was an unemployment blackspot in the 80s. More than 200,000 left Ireland in the 1980s. …if the plan to privatise water hadn’t been defeated, would Ringer have to pay the parish pump bill? Strange… I live right beside this length of track, and it isn’t finished. A digger spent a few weeks clearing bryers. And lated some gravel either side of the track. I don’t see anything else along it. This kind of nonsense goes on wholesale in the County Councils.